1. 1962 Dodge Color, Trim, Option and Regional Codes. Totals by Body Model and Serial Number List. 2. 1963 Dodge Color, Trim, Option and Regional Codes. Totals by Body Model and Serial Number List. 3. 1964 Dodge Color, Trim, Option and Regional Codes. Totals by Body Model and Serial Number List. 4. 1962 Plymouth Color, Trim, Option and Regional Codes. Totals by Body Model and Serial Number List. 5. 1963 Plymouth Color, Trim, Option and Regional Codes. Totals by Body Model and Serial Number List. 6. 1964 Plymouth Color, Trim, Option and Regional Codes. Totals by Body Model and Serial Number List. 7. 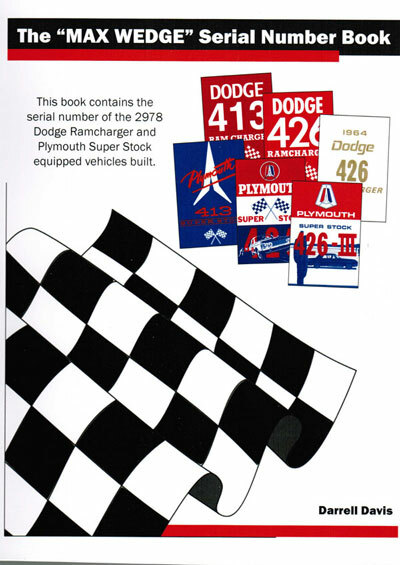 Documentation available from the Chrysler Historical Collection.